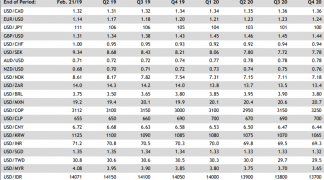 The Euro will rise strongly this year, according to the latest forecasts from Australia and New Zealand Banking Group (ANZ), and there may even be a case for it to trade at overvalued levels given the Eurozone’s healthy international trade position. A roaring economic upturn across the bloc already drew international investors back into the Eurozone by their droves last year, pushing the Euro 16% higher against the Dollar during the 12 months to the end of February. This is likely to contribute toward the Euro reaching fresh new highs against the Dollar and putting in a strong performance against the Pound in 2018. 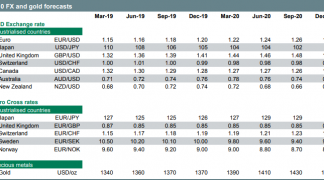 However, given a changing outlook for the US Dollar and a perkier Sterling interest rate outlook, the Eurozone currency will have to more heavy lifting over coming months than it did last year. “We anticipate further modest appreciation in EUR/USD this year as investors continue to re-weight exposure to the euro area,” says Brian Martin, an FX strategist at ANZ. The Eurozone economy grew by 2.5% during 2017, its best year for more than a decade, while the latest European Central Bank estimates suggest the Euro area’s potential growth is only “slightly above 1%”. Growth so far ahead of potential can be expected to augur rising inflation and interest rate expectations over coming years. This is a positive medium term dynamic for the Euro. Meanwhile, improving public finances and receding levels of risk around indebted Euro area governments will also be positive pull factors for investors, and a boon for the Euro. So too will the Eurozone’s large trade surplus which, feeding its current account surplus, is set to benefit from the ongoing upturn in global growth. “Further, in a general equilibrium world, the euro area’s twin surplus (~2.7% of GDP) could make a case for moderate EUR overvaluation. As ECB policy settings are seen as ill-suited to the future economic landscape, the exchange rate should continue to appreciate,” Martin says. The combined Eurozone current account and trade surplus is equal to 2.7% of all Euro area GDP, which can provide substantial support to the Euro relative other currencies. The European Central Bank winding down its quantitative easing bond buying program later in the year can provide a healthy tailwind to the single currency in 2018 and beyond too. Markets are already wondering when Eurozone policymakers will begin raising interest rates. A large part of the Euro’s rise in 2017 was the result of a weaker US Dollar which, falling by around 10% against a whole basket of currencies, emerged the loser from last year’s global economic upturn. This was initially the result of investors chasing faster growth and rising returns elsewhere, given an improved risk appetite in markets and the fairly mature stage of the US economic cycle. However, the greenback was latterly struck by concerns President Donald Trump’s tax cuts would see Americans selling Dollars to buy more imports and the government borrowing more from the rest of the world to fund a larger federal budget deficit. ANZ also forecast more upside for the Euro relative to the Pound in 2018, albeit to a lesser degree than that seen in 2017. The common currency had an easy ride against the Pound in 2017 as the British currency was buffeted by the UK’s slow march toward an EU exit. But, with the UK economy still motoring along and interest rates now rising, the Euro will have to work harder in order to overcome pushback from the Pound in the months ahead. “UK growth has held up well in the aftermath of the referendum decision (2017 GDP rose 1.7%) and labour market growth has remained firm (the UK created 321k jobs last year),” ANZ’s Martin says. The Bank of England warned in February that it could raise interest rates faster than previously expected if the inflation outlook evolves in line with its latest forecasts. Rising interest rates will support the Pound by drawing international capital away from markets where rates are either flat or falling. An increasingly intolerant attitude toward inflation at the BoE should provide some grounds for cheer during the months ahead, but Britain’s currency will remain subject to bouts of volatility owing to the Brexit negotiations, as was demonstrated Wednesday. “Sterling’s medium to longer run prospects remain clouded by uncertainty surrounding the Brexit negotiations. But short term sentiment is more receptive to the political manoeuvrings of the opposition Labour Party,” Martin notes. The opposition Labour Party has begun to pressure Prime Minister Theresa May over the EU customs union, which is the EU framework governing tariffs levied on imports from outside the union, leading markets to spy an opportunity. Labour is pushing for a replica of the current customs union after Brexit, which the government says would be hamper the UK’s post-Brexit international trade objectives and be a betrayal of the referendum result as it would not deliver independence from the EU. “Whilst politics and the future relationship with the EU are major uncertainties, an EU transition period until end-2021 is expected to be agreed soon,” says Martin. Above: Euro-to-Pound rate shown at weekly intervals. 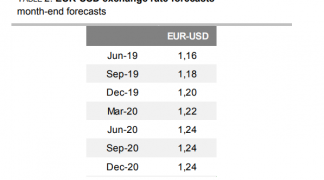 Martin and the ANZ team adjusted their exchange rate forecasts Wednesday, upgrading their projections for the Euro against the Dollar and Pound substantially. ANZ forecast the Euro-to-Dollar rate will end the 2018 year at 1.28 which, implying 5.% upside from Wednesday’s level of 1.22, represents a substantial upgrade from their earlier forecast of 1.15 that was made at the end of 2017. Between now and then, the Euro-to-Dollar rate is seen rising to 1.24 by the end of March to 1.25 in June and 1.27 in September. These are up from 1.15, 1.11 and 1.12 respectively. Relative to the Pound, the Euro is also seen gaining new ground, with the Euro-to-Pound pair forecast to end 2018 at 0.90. This is up substantially from the 0.84 forecast issue late in 2017 and represents nearly 2% upside from the 0.8857 level prevailing around the London close on Wednesday. 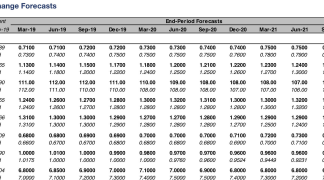 This forecast translates into a Pound-to-Euro rate of 1.111, which is down from the 1.1290 level seen Wednesday.